In the event of an untimely demise, you can still decide what happens to your Google data. Pending the discovery of a Fountain of Youth or consciousness-uploading technology, odds are about 100% that you are going to die one day. We don't have to think about it often, but we do like to be prepared: What do we want to have happen to our belongings? What do we want to leave behind for our loved ones? In a increasingly digital world, this is a complex question. Much of our identity is now tied to social networks and online accounts, locked behind passwords on various servers. Accessing that material after death requires a great deal of red tape, so Google is side-stepping the problem by letting users personally decide what happens when they kick the bucket. At that point, accounts can either be opened up to friends and family, or deleted outright if they so choose. 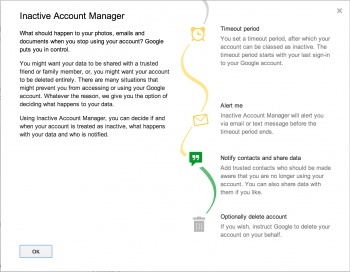 The service is called the Inactive Account Manager, a fairly sterile name (which Google fully admits) for a user-friendly process. Upon activating the Manager, account holders set an interval by which they can be considered inactive, with a max of twelve months. Once that interval is reached, up to ten trusted contacts will receive automated emails and texts informing them of what's happened. Trusted contacts can also be provided access to designated portions of the deceased's data, including everything from emails, blogs, phots, videos, and more. This is a great common-sense solution to handling inactive accounts, but it's also rare to see online. Facebook's policy, for example, requires a family member to submit proof of death before the website will recognize the deceased and memorialize their timeline. Google's solution puts control entirely in the hands of account holders, and lets them decide who can access their data. It wouldn't surprise me at all to see ideas like this adopted by other websites. After all, we may be spending more time on the internet than ever before, but we still never really know when that time is up. And now that we're all thoroughly reminded of our mortality, here's a video of a baby meeting a puppy.